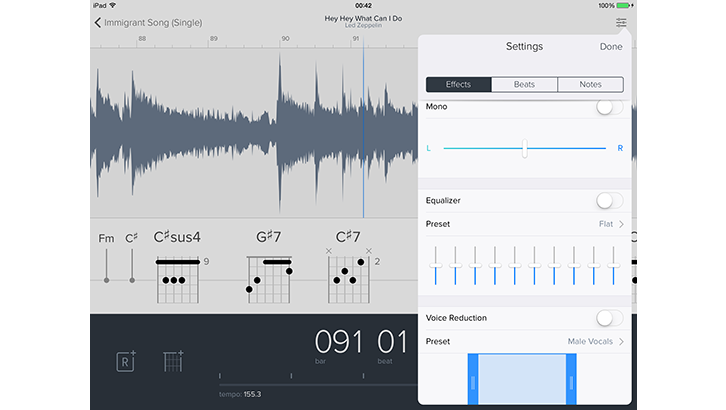 CAPO Touch, the iOS version of popular Mac App CAPO, arrived this week and the good news is – it rocks. For budding guitarists, the road to mastering this iconic instrument is long and arduous. Whether we take formal lessons or not, we all start out by mimicking our hero players and emulating the styles from favourite records. This would traditionally involve tinkering with your turntables to slow the RPM or constantly pausing and rewinding a cassette tape. Needless to say, picking apart those influential tunes to identify that elusive chord was no picnic. For the unfamiliar, CAPO apps basically allow you to import song audio and break down musically what’s being played. Fast-forward (pun intended) to the app age and beginners have had it much easier since the arrival of CAPO in 2011. Developers SuperMegaUltraGroovy scooped an Apple Design Award for this first version, currently enjoying a third iteration on Mac App Store. For the unfamiliar, CAPO apps basically allow you to import song audio and break down musically what’s being played. Chord and tablature are plotted during playback, providing powerful options to change tempo and key or pitch. CAPO Touch, available since Thursday (10th July), brings all this functionality to iPad and iPhone for the first time. Having been fortunate enough to play with it this past week, I can personally say it’s fabulous. What strikes you most initially is the purity of the apps design – so slick and refined. Controls are simplified and pushed back, maximising visibility for the output – especially important when juggling guitar and device. 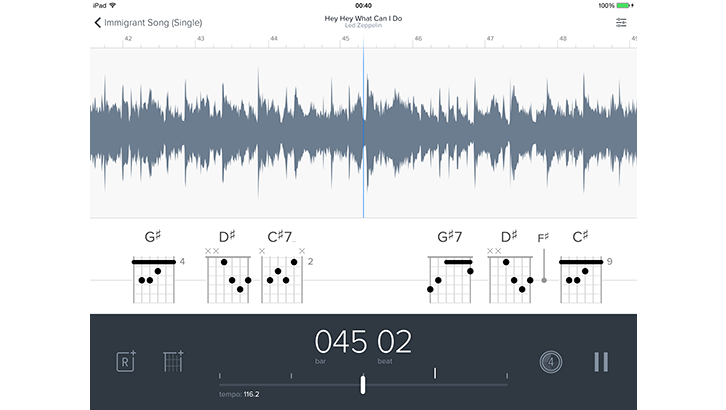 You simply pick a song from your iTunes library, hit play and watch the chords draw into view. Adding looped regions and slowing things down is then just a couple of pinches and swipes. The real mind-blower is the key changer however, where CAPO Touch’s use of licensed DIRAC technology comes into its own. Hearing the track instantly shift pitch without any degradation while chord diagrams transpose to fit is nothing short of magical. Advanced settings enable you to switch instrument types, adding versatility, alongside switching between exotic tunings and capo placements. iCloud Sync support then makes sharing song ‘projects’ a cakewalk, pushing your track adjustments to every Apple device. If there’s a downside, it’s whether more advanced players will feel the benefit. Where was CAPO and CAPO Touch while I was learning how to do this stuff in my head, I ask? My old Zeppelin cassettes bear the scars of its absence!